Washington was thought by some to be a potential seller ahead of Tuesday’s 4 p.m. ET deadline, and even star center fielder Bryce Harper was mentioned in trade rumors the previous night. But Harper stayed put, then collected a pair of RBI doubles as part of the offensive barrage. Former Met Daniel Murphy led the assault, going 3-for-4 with two home runs as the Nationals pounded out a team-record 26 hits. 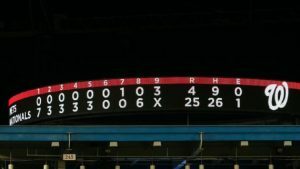 The 25 runs also were a franchise best, and marked the highest offensive output in the majors since the Texas Rangers beat the Baltimore Orioles 30-3 on Aug. 22, 2007. Facing New York starter Steven Matz, the Nats were locked in from the start, batting around and scoring seven times during a first inning in which leadoff man Trea Turner collected two hits and two steals. Just hours earlier, it was Turner who made news for other reasons; he met the media and apologized again for offensive tweets he made in 2011 and ’12 that surfaced over the weekend. 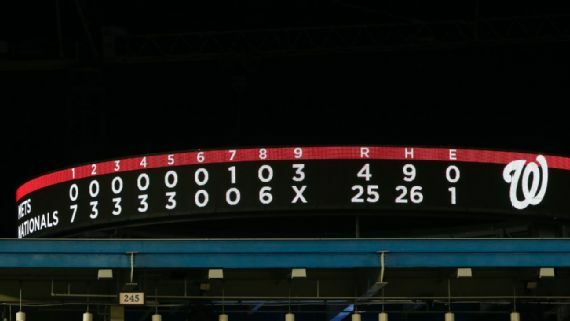 The Nationals, meanwhile, proceeded to plate three runs in each of the next four frames, becoming the first team since the 2011 Rangers to score at last three runs in each of the first five innings. Washington’s final six runs came off Reyes, who became the 38th position player to take the mound this season, the most since the beginning of the expansion era in 1961. 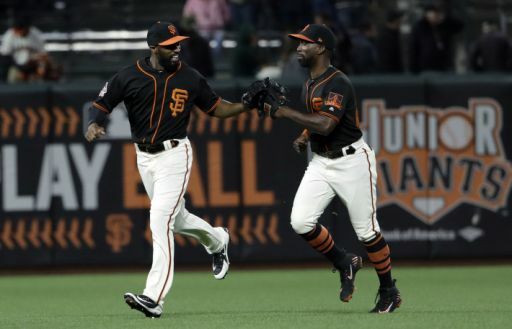 Reyes made the first pitching appearance of his career, and the 35-year-old infielder got tagged for home runs to Matt Adams and Mark Reynolds in a six-run eighth. Throwing a fastball in the mid-80s mph range and a curve in the upper 40s, Reyes gave up five hits and walked two. He also plunked Ryan Zimmerman with a soft toss. After getting hit in the leg, Zimmerman playfully faked a charge toward the mound, drawing a laugh from Reyes.